If you have seen error messages like “30061 - Error: Relational database BLABLA not found., Connector 'db2', Method -Connect- (-30061) - Relational database BLABLA not found.” or “Error: Communication error occurred on distributed database processing. See SQ30080 for invalid possibilities. A common error is that the password is case sensitive and is not being provided in the correct case” you’re not alone! 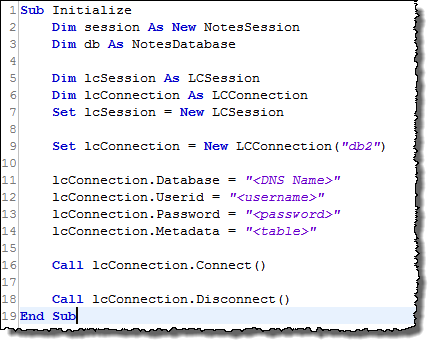 Read on how to see the bigger picture on how IBM i’s “Relational Database Directory Entries” should be configured based on what you see in the real target database. 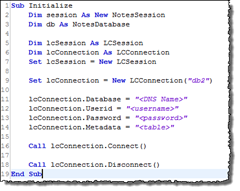 Finally you’ll see how to code Lotus Connectors LSX (LCLSX) to use this information to connect to the database. So how come the code above bails out at the Connect-method?